Anyone who knows me will agree to the sentiment that I am not a morning person, and if you should find me up before 8am on the weekend then there are generally only two viable reasons for this – either I am going hiking, or I am heading off to go travelling somewhere (or our cat Felix has been meowing from outside our bedroom door for the last hour so as to wake us up to give him attention). 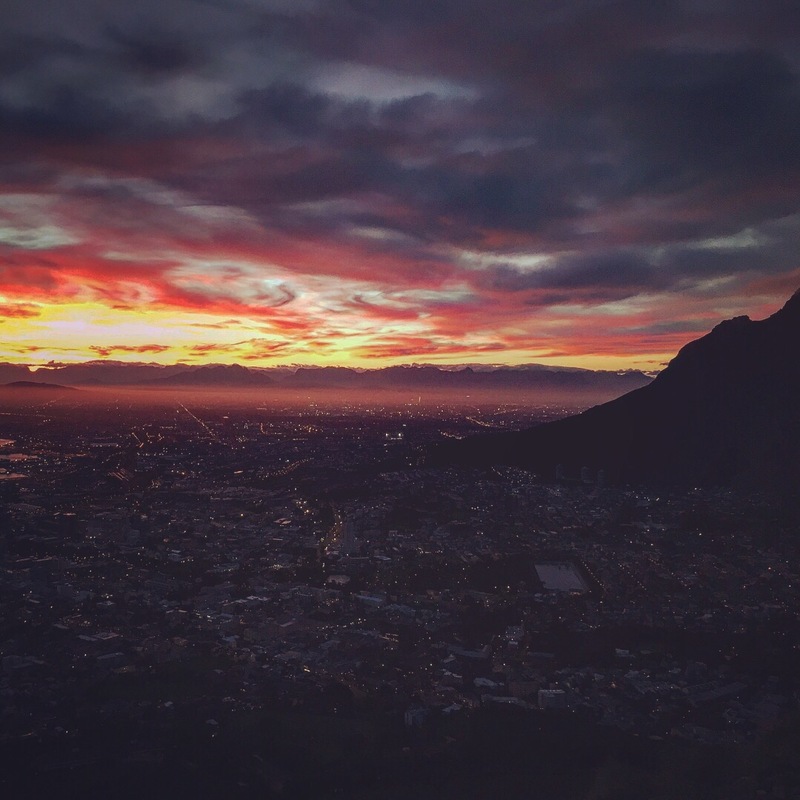 This morning it was the former and this saw Jon and I ‘up and at em’ just after 6am so that we could get ready and start our hike before the sun came up in order to catch the sunrise over Cape Town whilst walking. Two of our friends succumbed to the same temporary lack of good judgement and decided to brave the early hour and winter morning and join us on our sunrise mission. 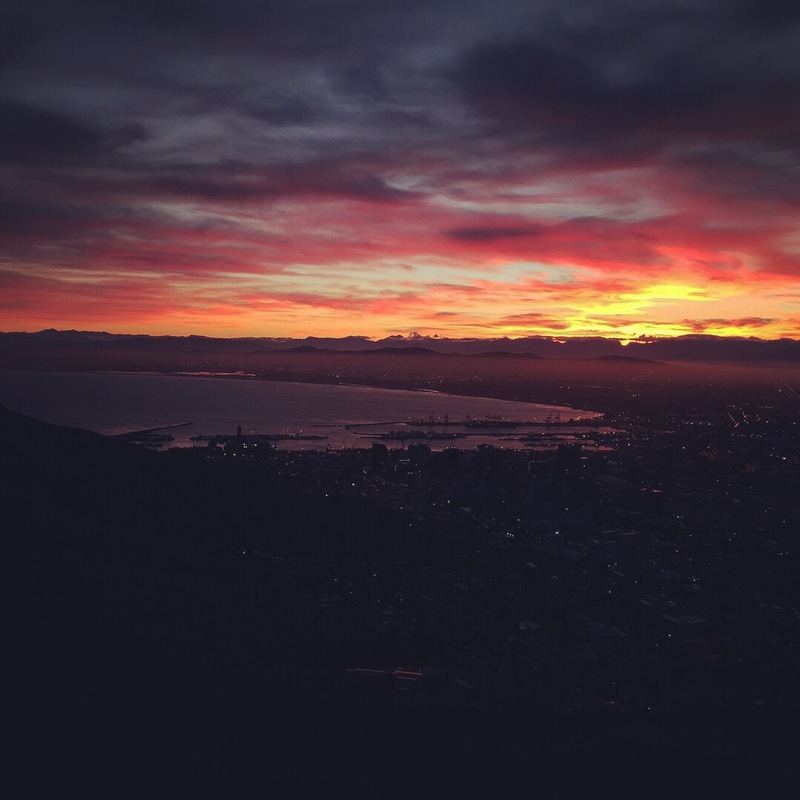 We decided to hike up Lion’s Head this morning, and 6.45am saw us begin our trek. It is winter here at the moment and at that hour it is still completely dark. Despite this fact, the parking lot was already full of cars and the trail already full of people eagerly chatting away and sounding way too chirpy for that time of the morning for my liking. The hike starts with a pretty steep uphill right away so in no time I was huffing and puffing trying to catch my breath in the cold morning air, whilst silently cursing at myself for suggesting to the others the idea of engaging in such a strenuous activity at such an inappropriate hour. Mornings, oh how I do love mornings! How very special it was to be able to experience that sunrise this very morning in the great company of Jon and our two friends. 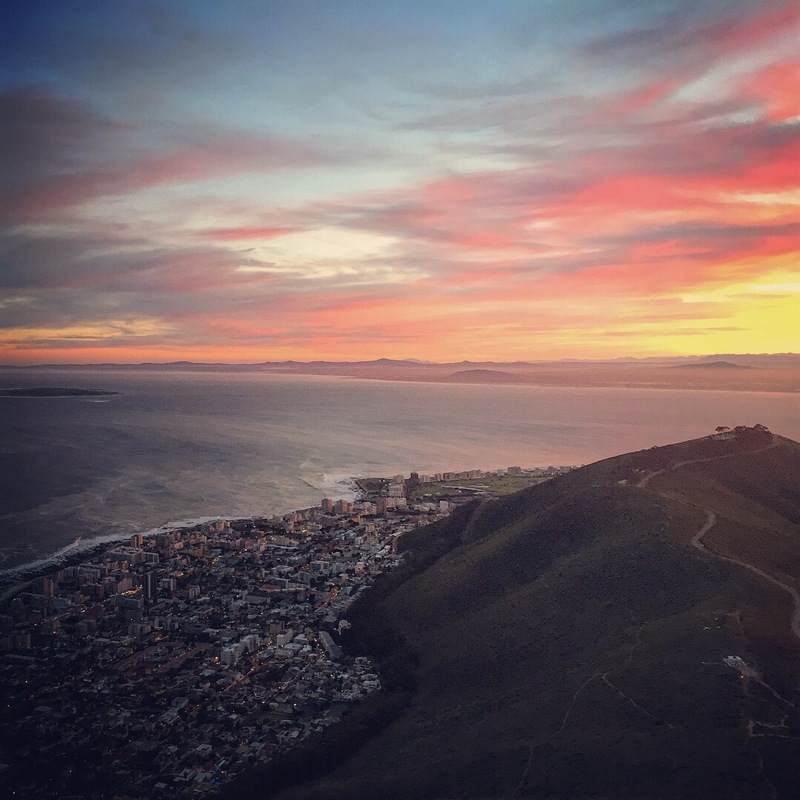 How amazing it is to be alive and living in beautiful Cape Town where you get the chance to experience these views on a daily basis if you so desire (I guess this is the part where the exercise endorphins finally kicked in and worked their magic). 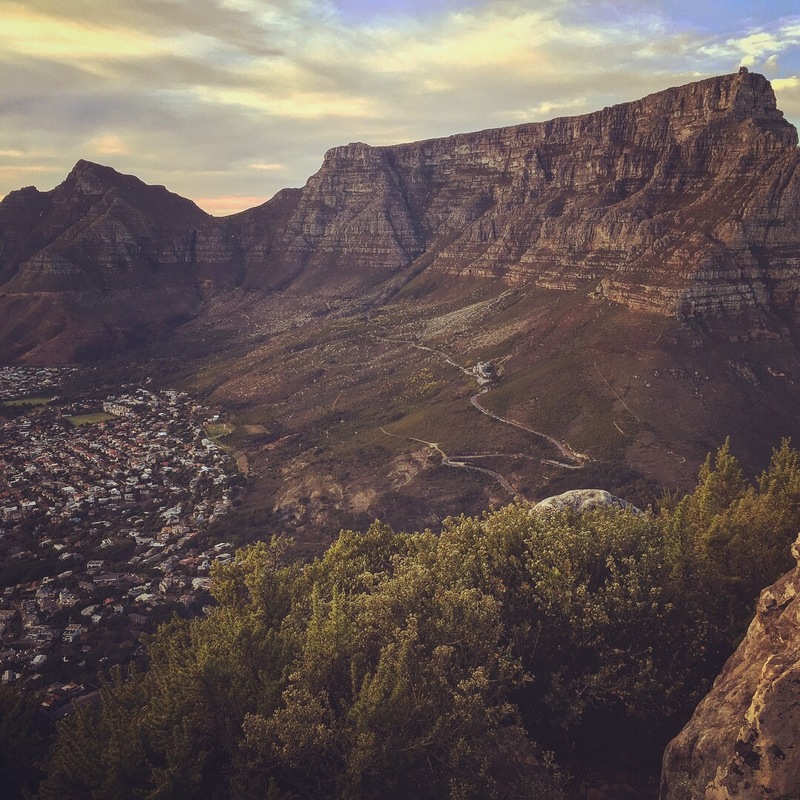 Luckily one does not have to be super fit in order to hike all the way up Lion’s Head and though it does require a bit of scrambling up rocks towards the top, it is not difficult by any stretch. This fact, combined with the amazing panoramic views all the way round up to the top, makes this a very popular hike so the route does get a bit busy over weekends when everyone is out to get their dose of fresh air for the day. We made it up to the peak in just over an hour – partly due to foot traffic but also partly due to the all the photo opportunity stops, and the sight that greeted us from the top was no less spectacular than the ones on the way up. You have Camp’s Bay and the ocean on one side, and the city and Table Mountain on the other side. It does not disappoint. It only gets a little cold and windy up there from time to time, this morning being no exception. By that stage though it was after the waking hour of 8am and a cup of coffee, a biscuit and the surrounding views were all that mattered.